Composer György Kurtág was born in Transylvania, but his many years of association with the Budapest conservatory have identified him as one of the foremost composers of Hungary, heir to Ligeti’s mantle as forward thinker and brilliant creator. ECM has been the label most associated with his music. Their release last decade of his string works was revelatory and one could certainly heap plaudits on the label’s celebration of Kurtág’s eightieth birthday in 2006 with a recording of his brilliant Kafka Fragments. 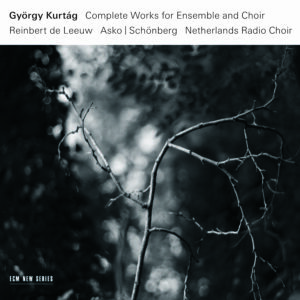 To celebrate his ninetieth year, just a smidge late, ECM has released a 3 CD set of Kurtág’s Complete Works for Ensemble and Choir. Even before listening, it is something to behold. ECM rightly has a reputation for lovingly curating their releases, but a number of interviews and essays (including program notes by Paul Griffiths), inclusion of the complete texts in sympathetic translations (no matter how thorny the originals), and many samples of the composer’s handwritten scores and ink drawings make this release a feast for the eyes. As for the ears, it has a remarkable dynamic range, clearly rendering everything from the softest whispers to thunderous bass drum thwacks with a sense of energetic potency. The variance of dynamics is just one part of the multi-layered structures found in this music. From fragments of instrumental sound and disordered declamation to walls of choral sound and altissimo register vocal climaxes, Kurtág’s work encompasses a wide range of expression. In terms of desire, grief, fear, exhaustion, resiliency, and pain, there seems to be not a shade of emotion missing: his music is a complete catalog of the modernist project. Conductor Reinbert de Leeuw elicits each of these emotions and musical demeanors in turn with the surest of hands, drawing consummately detailed performances from the assembled forces. If you make it your business to get one recording of music by Kurtág, this is it.